Evening bats, free-tailed bats and big brown bats like to roost in old dead trees. They hide behind loose bark, in cracks within the trunk or branches, or in holes carved out by birds or insects. These bats roost together in colonies ranging in size from just a few bats to a couple of hundred bats or more depending on the availability of space within the tree. In modern times they have adapted to man made structures such as buildings and bridges and often form very large colonies numbering in the thousands. 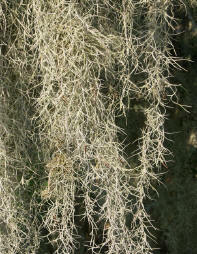 Seminole bats, yellow bats and pipistrelles often roost in Spanish moss. They do not usually roost in dead trees and do not move into man made structures. They also do not form colonies but usually roost singly. Mother bats, however, will stay with their young until they learn to fly and find insects for themselves. While they are raising their young they will be hanging onto her or roosting by her side. Years ago when Spanish moss was harvested for padding furniture it is likely that thousands of these bats were killed in the process. Although yellow bats will roost in Spanish moss, they also roost in old dead palm fronds. 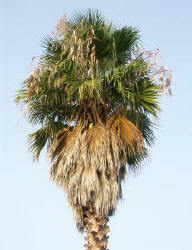 Their yellowish color blends in with the color of the fronds and makes them almost invisible. The dead palm fronds hanging down on the sides of sabal palms, also known as cabbage palms, serve as one of their favorite roost sites. It is almost impossible to find them since they hide so well and the color of their fur blends right in with the dead palm fronds. 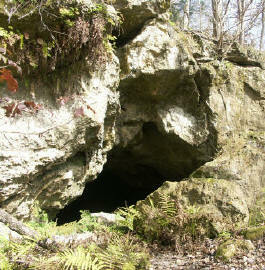 Some Florida bats roost in caves. If you want to see bats in Florida caves, a good place to go is Florida Caverns State Park in north Florida. Florida bats do not hibernate in caves during the winter like the bats up north, but they will lower their body temperature and heart rate and go into what is referred to as torpor to save energy on cold or rainy nights. Unfortunately, bats in caves are very vulnerable to disturbance and vandalism. Experienced cavers will not disturb colonies of bats in caves and will not enter caves with maternity colonies during the summer months. Evening bats, free-tailed Bats and big brown bats will also move into buildings and bat houses. Remember, they like old dead trees and bat houses made of wood provide a very similar type of roosting habitat. Bat houses should be located at least ten foot above the ground (the higher the better) and should be exposed to sunlight much of the day. The most successful bat house in Florida is located at the University of Florida in Gainesville. The U of F bat house is home to over 100,000 Florida bats. Most of these are free-tailed bats, but evening bats and southeastern myotis are also using this large bat condo. It is worth a trip to Gainesville just to watch these bats as they leave the bat house shortly after sunset to forage for insects!